A man attempted to walk across the mouth of the Ribble Estuary from Southport to Blackpool on Sunday (4th June 2017) but as he approached the north bank opposite Lytham Town he found the main channel of the River Ribble blocking his path. The tide had now turned and was quickly flooding the estuary leaving the man not enough time to retrace his steps over four miles to safety. Fortunately the 10 mile perch, a tall wooden navigation aid marking the river channel, was close enough for him to wade to and scramble half way up to comparative safety above the level of the rapidly rising tide. The man could not be left exposed up the perch all night so Her Majesty’s Coastguard requested the Lytham St Annes D class Inshore Lifeboat (ILB) MOAM to launch at 6.05pm and rescue him from his precarious position and bring him across to Lytham. The ILB was taken to Seafield slipway and launched under the command of Helmsman Vinny Pedley. Extricating the man from his lofty perch, the ILB brought him across the river, returning to Seafield Road slipway. 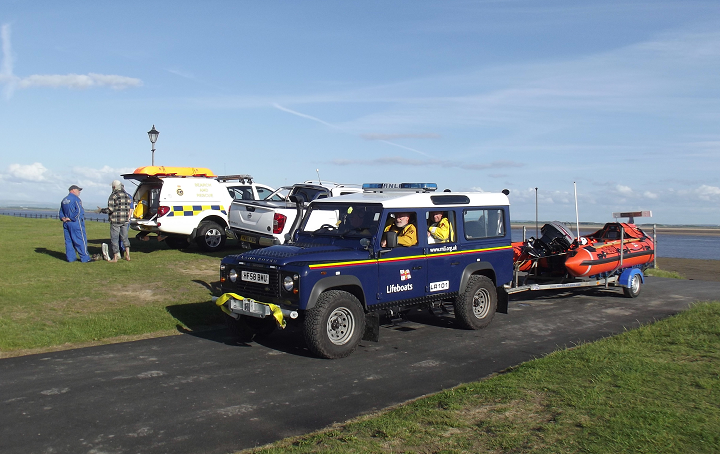 The RNLI Volunteers then passed him into the care of the Lytham St Annes Coastguard Team who made sure he was fit and capable to continue his journey to Blackpool unaided. The ILB was returned to her boathouse and refuelled, washed off and made ready for the next time she is needed.